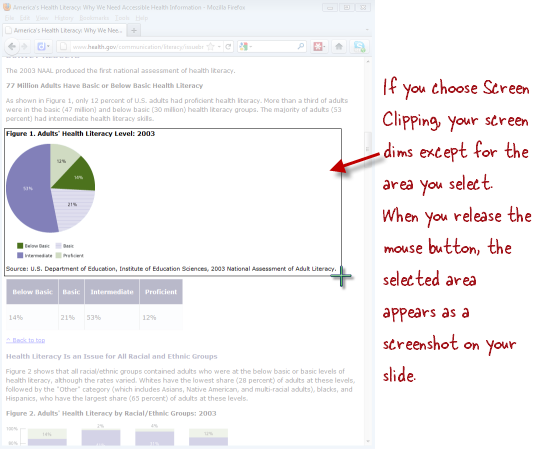 While viewing a slide, a slide layer, or a slide master, click the Insert tab, and choose Screenshot. A dropdown list of thumbnails will appear. Each one represents an open application or browser window. Minimized applications won't appear in the list. Hover over any thumbnail in the list to see the application or window name, and click one to insert a screenshot of that item onto the current slide. Or, if you prefer to take a screenshot of just part of your screen (rather than an entire open window), choose Screen Clipping from the bottom of the list. If you chose Screen Clipping, your screen will dim and your Storyline window will disappear temporarily. Click and drag on your screen to select the area you want to capture. The selected area will appear non-dimmed. 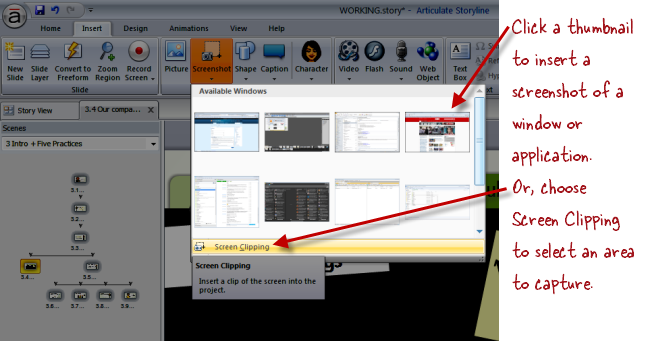 When you release your mouse button, the Storyline window will return, with your screen clipping on the current slide. Once you insert a screenshot, it behaves like any other image. You can move it, resize it, crop it, animate it, or apply any other image effects that you like.